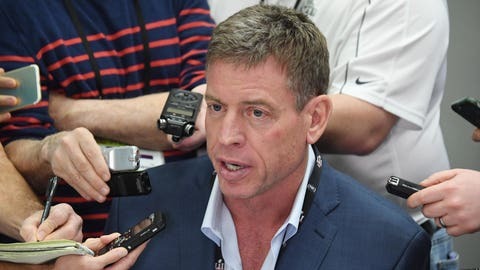 Recently, former quarterback Troy Aikman attempted to evaluate New England Patriots quarterback Jimmy Garoppolo. What did he see? New England Patriots quarterback Jimmy Garoppolo will be the subject of many trade rumors this offseason. With Tom Brady still playing at a high level, the Patriots will likely entertain trading him for a few draft picks. Despite being a second round pick, we don’t know all that much about Garoppolo. He was able to play in six quarters of football this season for the suspended Brady. However, that is an extremely small sample size. Recently, Fox analyst and former quarterback Troy Aikman tried to evaluate Garoppolo. Here’s what he had to say. Aikman points out that teams are willing to take shots on players that they think can be franchise quarterbacks. As recently as last season, we saw the Houston Texans give Brock Osweiler a huge contract, even though he didn’t play all that much for the Broncos. One of the things that a team has to worry about when trading for Garoppolo is how much the Patriots’ system benefited him in his short stint as the starter. We have seen what happened to Matt Cassel after he left New England. In his one year as a starter, he looked like he could be one of the best quarterbacks in the league. When he left New England, he was nothing more than a backup quarterback. Next: What were the 5 key moments of the 2016 season? Despite those concerns, a team this offseason will likely take a shot on trading for Garoppolo. With the NFL Draft not having a strong quarterback class, that will only help the Patriots get a haul for Garoppolo in a trade.